Fish Fry - Rainbow Restaurant & Diner - Best Homemade Food in New Berlin, WI! Beer Battered Cod A customer once asked us, "Why is your fish fry so good? What do you do that is so different from everyone else?" After 39 years, the answer is simple. First, we soak our cod in beer and then hand dip it into the batter just before we drop in the fryer. It's this simple technique that makes the fish light and crispy. 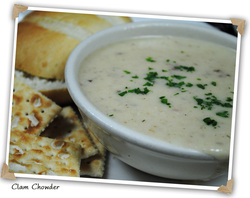 Homemade Clam Chowder There is no question... Lily's Clam Chowder is our top selling soup! We make it from scratch every Friday morning! We're not really sure where the 39 year old recipe came from, but one thing is for sure... the recipe is a closely guarded secret! We can tell you that the soup starts with a pound of butter, real clams, heavy cream and milk. Yes! Nothing but rich flavor. No wonder it's the best! 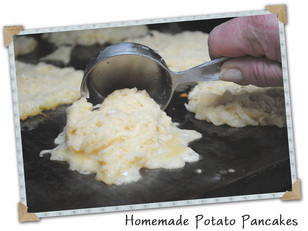 Potato Pancakes Our customers tell us repeatedly that we have the best Potato Pancakes around! The reason why is simple! We mix them each Friday morning from fresh potatoes and you'll never catch us cooking them ahead of time... we fry them up with a little oil only when you place your order. That is why they are crispy on the outside and soft on the inside. Check out our entire Fish Fry menu!